When it comes to making decisions around color, do you often find yourself making conservative choices? Or maybe you're just the opposite? And you find yourself selecting color palettes that are a bit more of modern and unexpected? Whatever types of colors you lean toward, one thing is for sure... there really isn't a shortage of gorgeous color palettes to choose from! Am I right? Speaking of gorgeous color palettes, that brings me to today's post. Ever consider pairing pink with teal tones? I really am loving the contrast here and I'm hoping you are too! It's colors like these that I see perfect for Spring and Summer. And more specifically, I really think these colors would look amazing for a destination wedding. Maybe even a beachy setting? So what do you think? Might you use this palette for your upcoming wedding, party or project? I'd love to hear your thoughts! 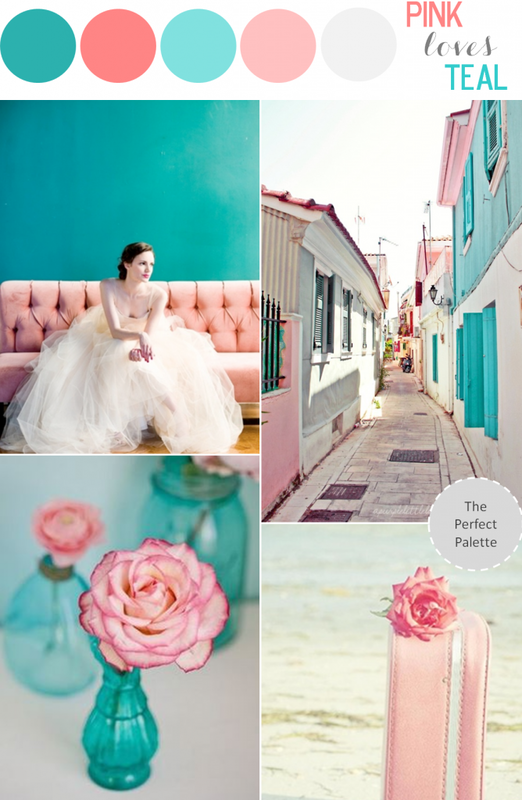 30 Comments " Color Story | Pink Loves Teal "
These colors are so beautiful together. And anything by Caroll Hannah is lovely, but that gown is gorgeous! Oh wow :) I really like this one! oh my gosh - that exterior shot - LOVE IT! Adore this board Chrissy - it's perfect! I play it pretty safe when it comes to color, but oh how I love a match like this! Oh, wow! I'm in love. So elegant. I really like this one. The colors are the perfect contrast to one another. I'm in love with this combo! Stunning! This is one of my favorite combos! The colors go great together! They are perfect combo. These are actually my wedding color. That’s a pretty challenging question you have there. Well for me, I think it will depend on the need. If you want to play safe, then choose the conservative ones. But if you want to be extraordinary and have fun, then spice it up with different vibrant colors. Hope you’ll have a great weekend! A lot of blogs I see these days don't really provide anything that I'm interested in, but I'm most definately interested in this one. Just thought that I would post and let you know. Nice! thank you so much! Thank you for sharing. Gracias por compartir su pasión por el mejoramiento de Jogos Friv Kizi Games Friv Games las vidas de los niños en el Estado de Friv Jeux De Fille Jogos Friv Gracias por vuestras reacciones a Jogos Friv Juegos Friv Juegos Kizi Juegos Kizi las transmisiones que os han hecho.